Melt the butter in a saute pan set over medium-high heat. Add the potato slices to the pan and cook until they have become slightly brown around the edges. Add the caramelized onions and gently toss together. Set the potato mixture aside, allowing it to cool. Stretch the pizza dough into a round shell, 10 inches in diameter. Place the dough onto a lightly floured work surface and brush with the garlic-flavored olive oil. Ladle the bechamel sauce onto the dough, spreading it evenly over the entire surface. Sprinkle the mozzarella and fontina cheeses onto the dough. 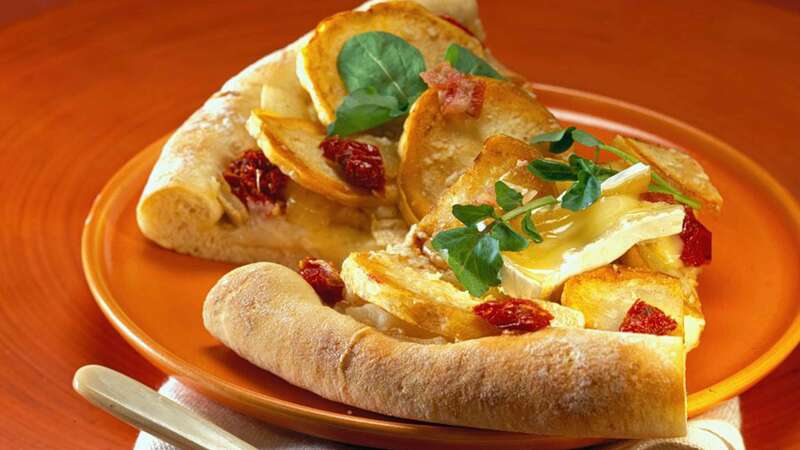 Place the potato and onion mixture onto the pizza dough, evenly distributing them over the entire surface. Sprinkle the oven-roasted tomato pieces over the potatoes. Layer the slices of Brie cheese onto the pizza in a "star" pattern. Sprinkle the Parmesan and Romano cheeses over the pizza. Using a pizza paddle or flat-sided sheet tray, transfer the pizza to a preheated pizza stone in a wood-burning oven, and bake for 4 to 5 minutes (5 to 7 minutes for a conventional oven) or until the crust has become crispy and golden brown. While the pizza is cooking, toss together the watercress, arugula, pancetta, olive oil, lemon juice, salt and pepper. Set aside. When the pizza is done, remove it from the oven, and cut into 4 or 6 pieces. Transfer to a serving platter, drizzle a little creme fraiche evenly over the top, and garnish the pizza with the watercress and arugula salad. Serve immediately. is butter that has had the milk solids and water removed. One advantage of clarified butter is that it has a much higher smoke point, so you can cook with it at higher temperatures without it browning and burning. Also, without the milk solids, clarified butter can be kept for much longer without going rancid. It is very easy to make. Melt the butter slowly. Let it sit for a bit to separate. Skim off the foam that rises to the top, and gently pour the butter off of the milk solids, which have settled to the bottom. A stick (8 tablespoons) of butter will produce about 6 tablespoons of clarified butter. Another method is to simmer the butter in a saucepan until the mixture separates. After the water has evaporated, the milk solids will begin to fry in the clear butterfat. When they begin to turn golden, remove the pan from the heat and pour the butter through a fine strainer lined with damp cheesecloth into a heatproof container. If the cheesecloth is damp, all the butterfat will pass through, otherwise some will be absorbed by the cloth. This method is a little fussier, but produces a clearer result.